Summer has just begun, but temperatures are already rising! Are you ready for a heat wave? Take advantage of these tips to keep it cool at home during these hot summer days. While you may be tempted to let the sun shine in on pretty summer days, you’ll keep your Loft cooler and save on energy costs by keeping the blinds and curtains closed. Nearly 30 percent of the heat inside your Loft comes from the windows, so you may be surprised at how effective this can be. Don’t want to close them all and sit in the dark? Focus on the west and south facing windows. Ceiling fans can be used strategically to help keep you cool on warm days. In the summer flip the switch so the blades turn counter-clockwise. This blows a cooling air down onto you. You can also place box fans inside your windows facing out to draw hot air outside the Loft. Be sure to swap those cozy flannel sheets you love in the winter for something a little lighter during the summer. Cotton is the best choice this time of year. Want to take it a step further on those really warm nights? Pop them in the freezer for a few minutes before going to bed. Just be sure to put them in a plastic bag first so they don’t smell like frozen broccoli. Ovens, dishwashers and clothes dryer can generate more heat than you may realize. Wait until evening hours to run heat-generating appliances. If you haven’t already, make the switch to LED lights around your home, as they don’t kick out heat the way incandescent lights do. Nothing beats the heat like a nice cold shower, which is especially refreshing right before bed. Sip cool drinks throughout the day to keep your internal temperature low and don’t be afraid to slip an ice pack under the sheets at night. Have a room or two in your Loft that isn’t regularly used? Shut the vents and close the door to that room. No need to cool it if nobody will be inside it. Your air conditioner works hard in the summer months. Make it easier for it to get the job done by keeping the vents and ducts clean and changing the filters frequently. Save money on your cooling costs by using a programmable thermostat and turn the temperature up during those times when you’re out of the house. Just remember to keep it cool enough for pets that may be home during that time. As tempting as it may be to get some home improvement projects completed over the summer months, don’t overdo it. Pay attention to weather reports and plan to take it easy when a heat wave hits. 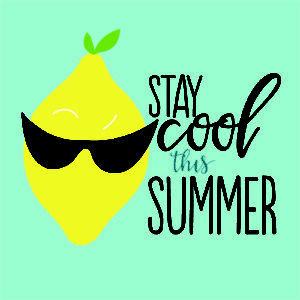 It’s summertime – give yourself permission to slow down, take a break and sip a glass of ice-cold lemonade on the porch.